Our first stop in Mexico was in the resort area of Cancun. Here we spent our time at a hotel resort on the beach so the birds we saw were the kinds of birds that you might expect to see in such an area, but coming from the U.S., even “common birds” were fascinating to us. 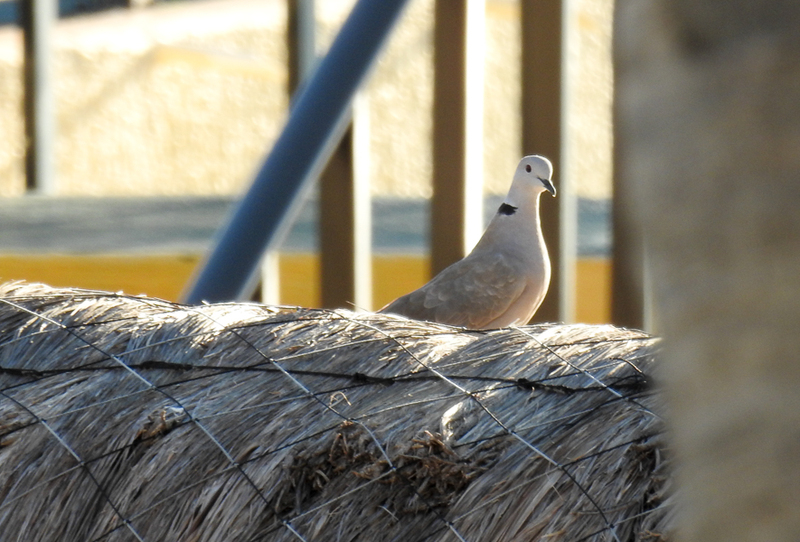 Eurasian Collared Dove: This little beauty liked to sit on the thatched roof of one of the structures near the hotel pool. These birds reminded me of the Mourning Doves we see up here in Maryland. 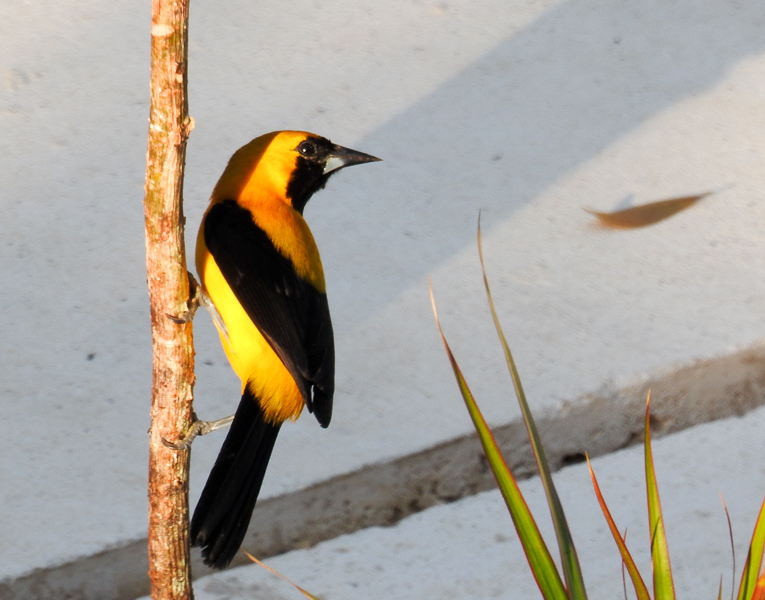 Hooded Oriole: There was an active pair of Hooded Orioles up in the palm trees surrounding the pool. We could look right from our balcony into the tops of the palms. They seemed to be finding something tasty in the trees, so they were often to be found there. 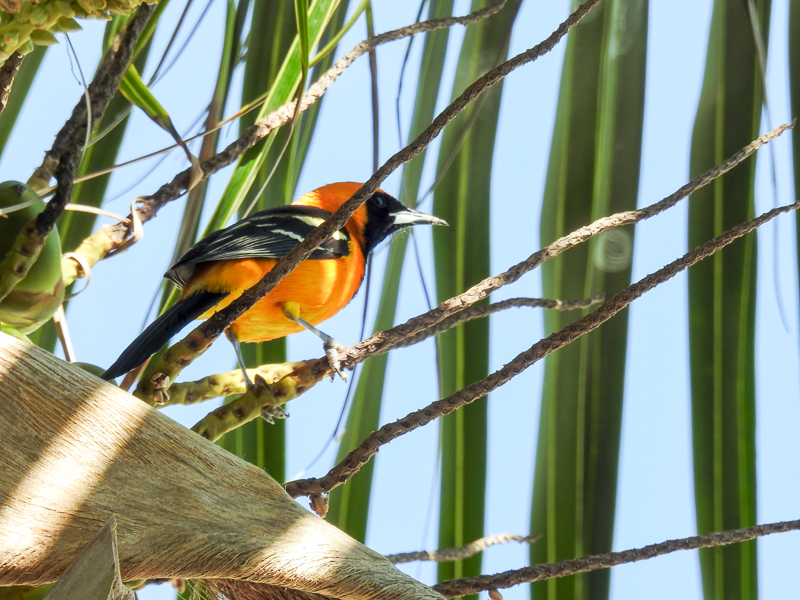 All About Birds says these birds have the nickname, “palm-leaf oriole” because they like to nest in palm trees. Great-Tailed Grackle: I must admit that this one confused me for awhile. I thought it might be a Melodious Blackbird, which are common there, but the eyes say “grackle” and not “blackbird.” I finally figured out that this browner bird, with a much shorter tail than her male counterpart, is actually a female Great-Tailed Grackle. 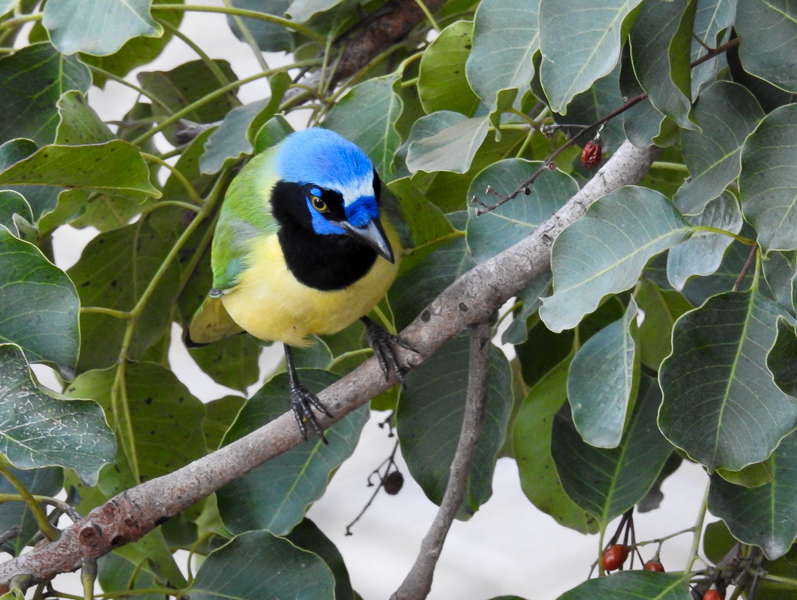 Several of these noisy, bold birds hung out poolside and would hop around on the balconies as well. We saw them all kinds of places on our trip. In Tulum, we stayed in a newly built townhouse that still had a lot of natural jungle/wooded area around it. I tend to wake up earlier than everyone else, so I would get a cup of coffee and go up onto the roof to watch the local birds wake up and move around in the wooded area in back or in the open neighborhood street area out front. Green Jay: Each morning I watched a small group of of beautifully patterned Green Jays poking around out in front of the townhouses. This area was made up of mostly a small neighborhood street, paved walks and gravel with small trees. The Green Jays reminded me of our local Blue Jays in the way they interacted in their small group. 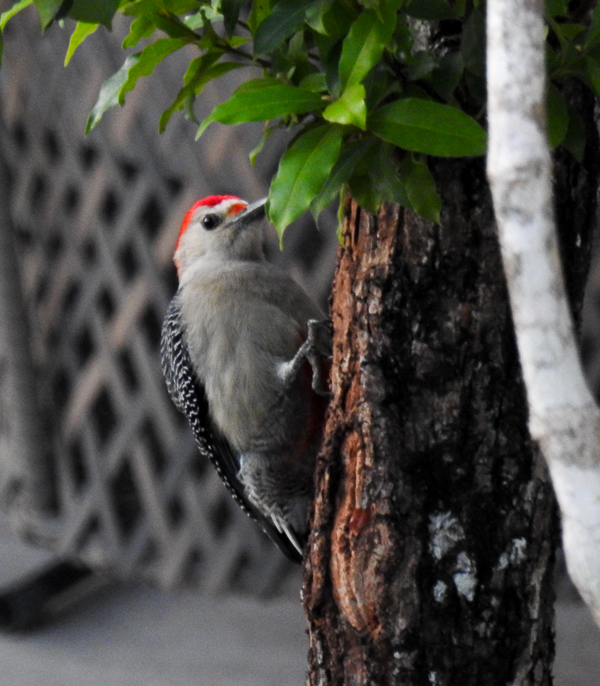 Yucatan Woodpecker: I also saw Yucatan Woodpeckers every day in this same area. They look very much like our Red-Bellied Woodpeckers and their behavior seemed similar. This one seemed to be finding some good bugs in this tree in a neighbor’s yard just across the street. 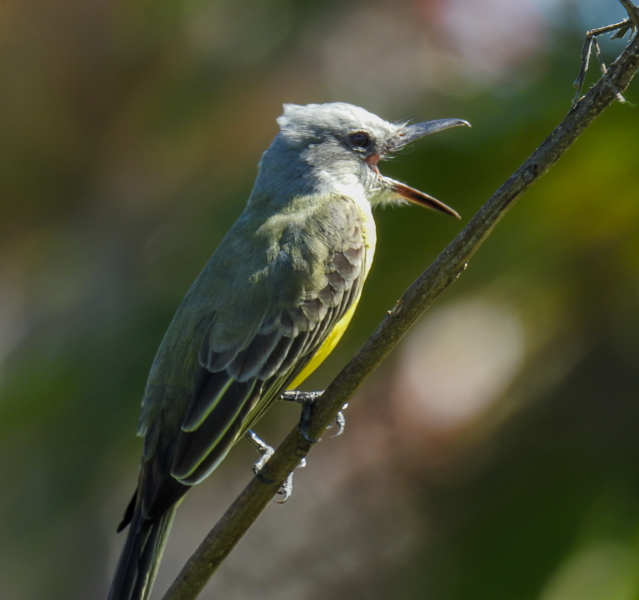 Yellow-Backed Oriole: Here in Tulum, a small group of very active Yellow-Backed Orioles were also hanging out in front of the townhouses. They seemed less bold than the Jays but just as active. 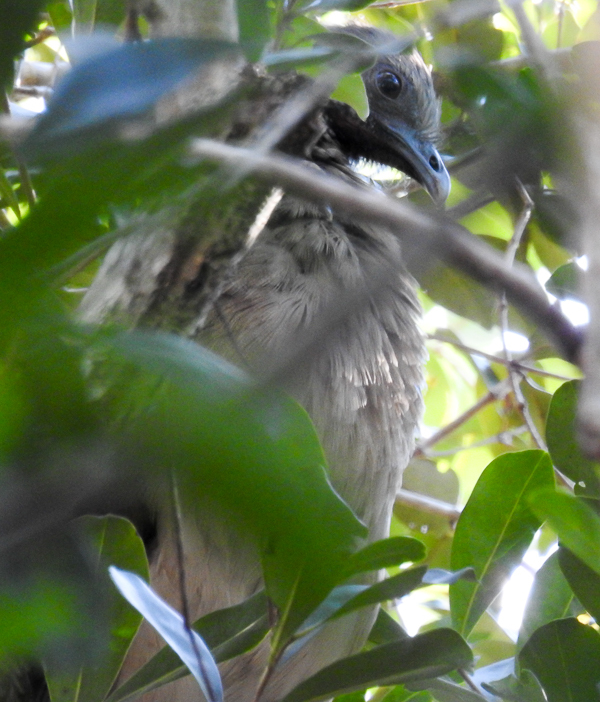 Plain Chachalaca: Hiding in the trees behind the townhouse were a pair of Plain Chachalacas. These were the most unusual of the birds we saw. They were huge compared to the jays and orioles (22″ long.) It always amazes me how birds can disappear into trees. You can know they are there but still not see them. These birds were like that. 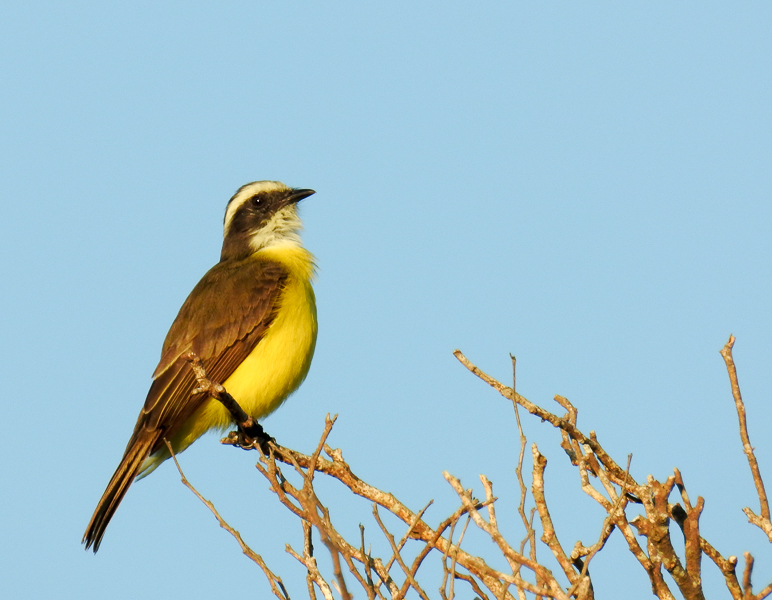 Tropical Kingbird: This particular bird was sitting on a tree in the ruins at Tulum, but we saw this type of flycatcher often in various locations throughout our trip. Insects would be justified to be alarmed at that bill! 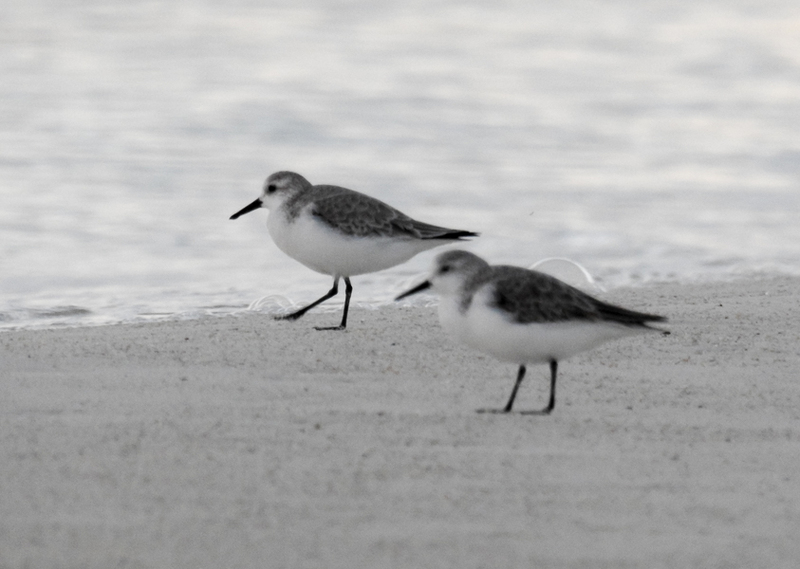 Sanderlings: At a nearby beach, we watched large flocks of Sanderlings scurrying along the sand in the early evening. The third place we stayed during out trip was the city of Merida. From there, we took a day trip to visit the town of Progresso where there is a strip of restaurants and shops along the beach. Sitting at an outside table at one of the restaurants and then walking up to where the four-mile-long cruise ship pier meets the beach, we could watch all kinds of interesting birds. Magnificent Frigatebird: These are HUGE birds. 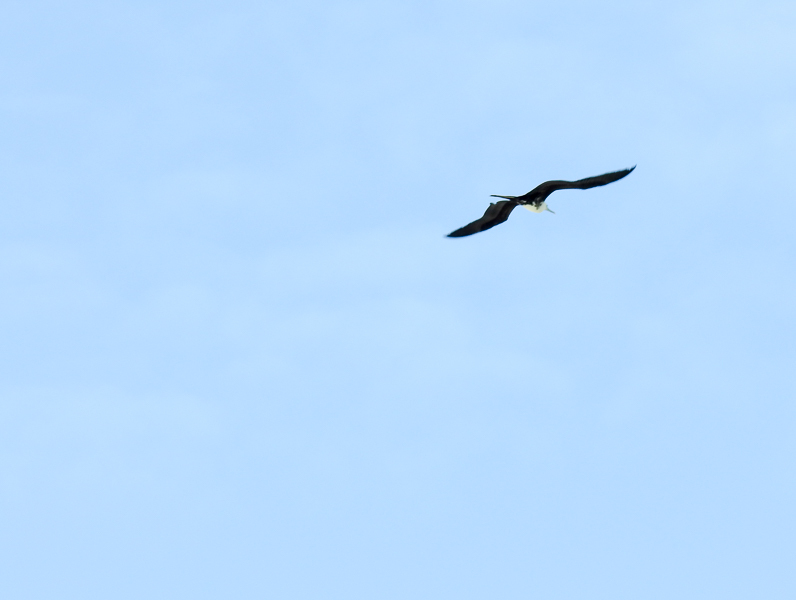 They flew up high up and parallel to the shore regularly during the hours that we spent there. Impressive birds that soar gracefully, they caught my eye every time they flew past. The ones that we saw were simply flying but apparently they can be very aggressive about stealing food from other birds. 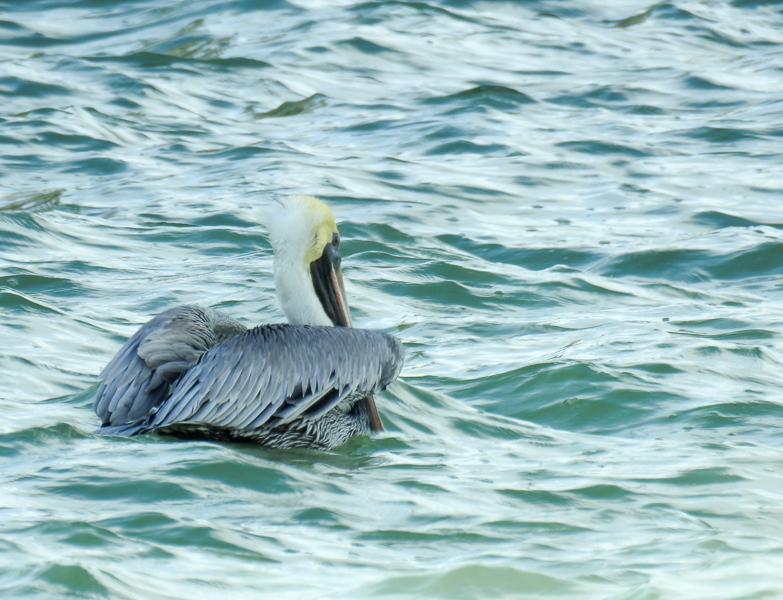 Brown Pelican: Another bird we saw a lot of in the waters of Progresso was the Brown Pelican. They were very busy diving repeatedly for fish down by the pier. They were fun to watch. 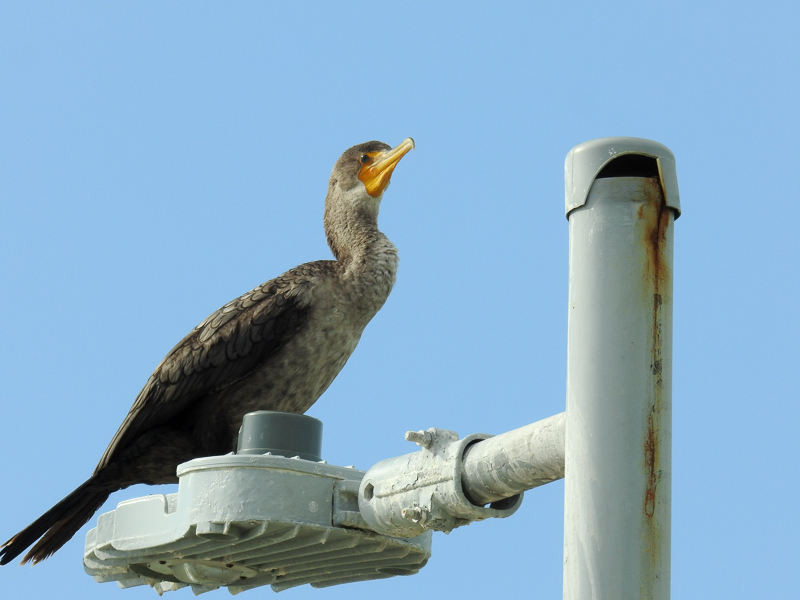 Double-Crested Cormorant: On and near the pier, it seemed like almost every pole had a Cormorant seated on it. At first I thought they might be Neotropical Cormorants, which can be found in this area as well, but the ones I could see were the Double-Crested Cormorants, like those we see up our way. 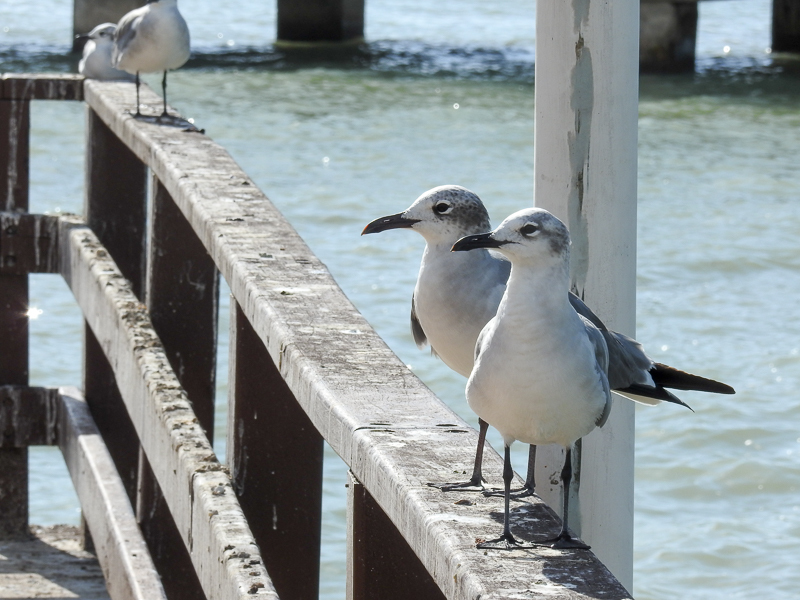 Laughing Gulls: If you are near the ocean, it seems that there must be gulls somewhere around. This group of Laughing Gulls seemed quite content to let me take their picture. Rock Pigeon: Mexico has Rock Pigeons just like we do, but I swear it seemed like there was more variety in their coloring there. I thought the colors on this one were unusual but lovely. In Merida itself we were mostly doing more city type things, but there was a small park in the neighborhood where we were staying that was very active with birds. The first evening we were there, a Barn Owl flew right over our heads. Each morning we awakened to the sound of very vocal Melodious Blackbirds. One day a Cinnamon Hummingbird took an interest in a flowered dress that was hanging on the line in the back yard of the house where we were staying and every evening you could see Vaux’s Swifts zipping busily around in the skies over the area. 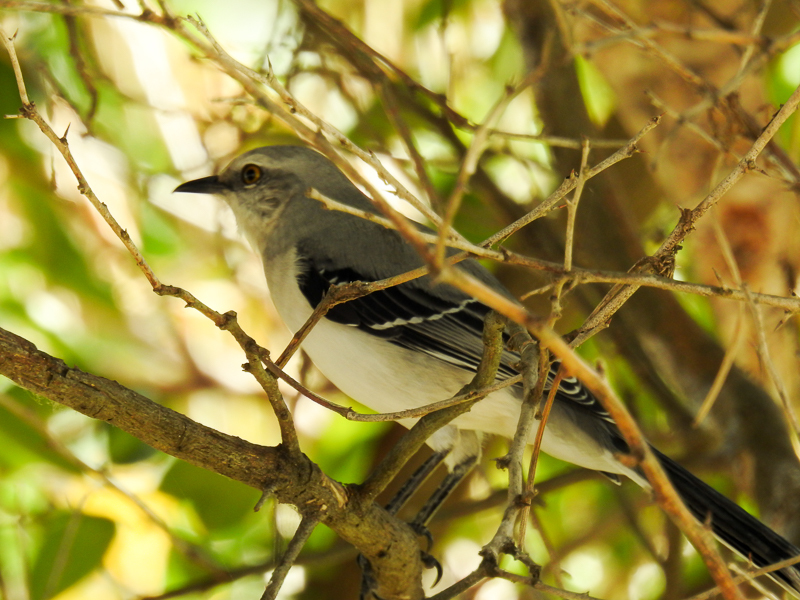 Tropical Mockingbird: This Tropical Mockingbird was a regular at the house where we stayed and in the little park nearby. Here it was sitting tucked inside tree branches but we often saw them perched on top of wires or poles or the very tops of trees looking out. 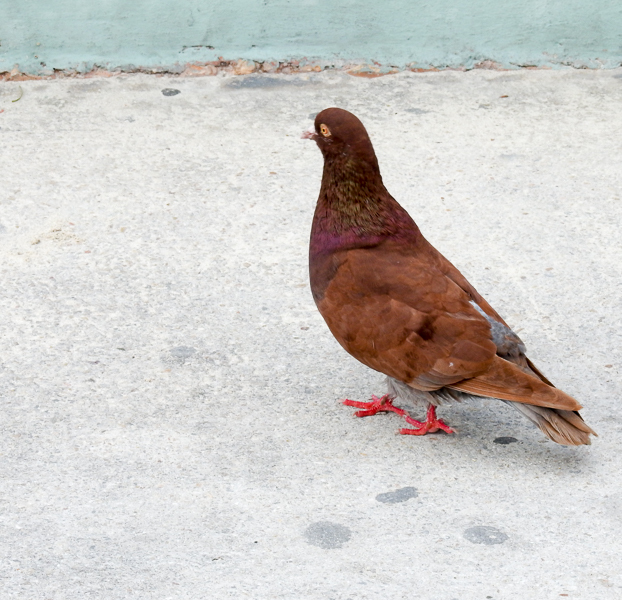 Ruddy Ground Dove: There were a variety of pigeons and doves at the park. 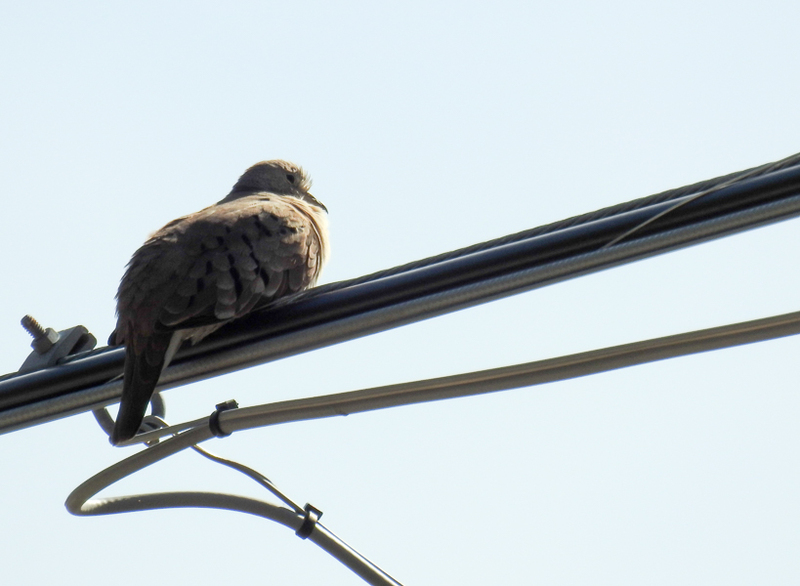 The smallest was the Ruddy Ground Dove, who is sitting up on a wire here but could also be seen poking around on the ground looking for seeds as his name might suggest. 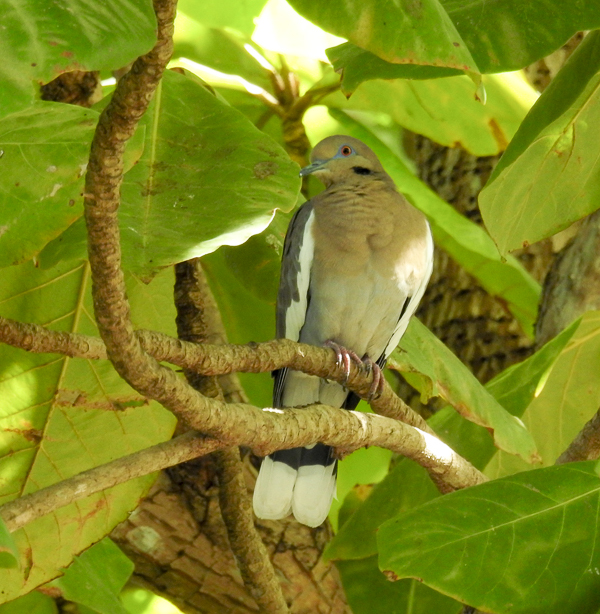 White-Winged Dove: A bit bigger than the Ground Dove is the White-Winged Dove. We saw one in a tree behind the house and here again at the park. They are lovely birds. 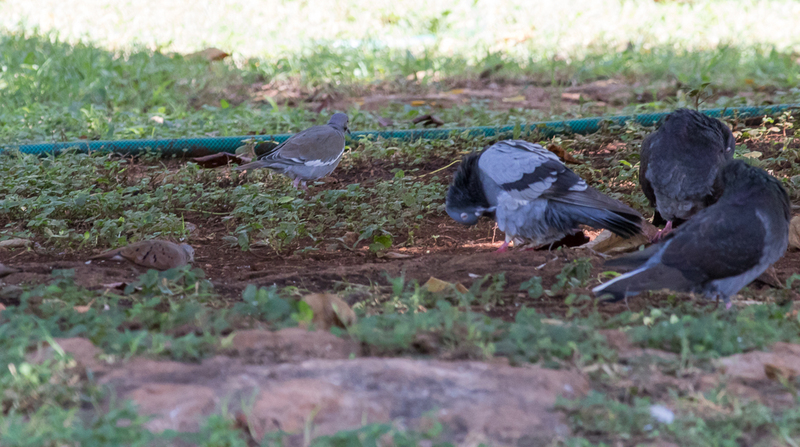 Ruddy Ground Dove, White-Winged Dove & Rock Pigeons: This photo isn’t going to win any awards but I think it is interesting. If you look carefully near the middle left side of the photo, you’ll see a little brown Ruddy Ground Dove. At the middle nearer the top by the green hose, is a White-Winged Dove and to the right are three much larger Rock Pigeons. Sometimes when you see a bird in a field guide, you don’t get a real sense of their size. Here you can compare the three birds side by side. 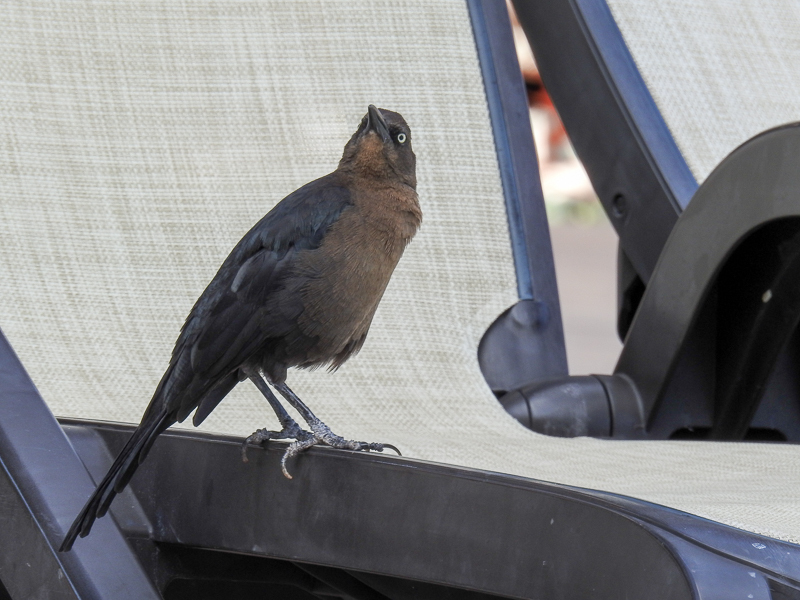 Great-Tailed Grackle: Remember the female Great-Tailed Grackle from poolside in Cancun? 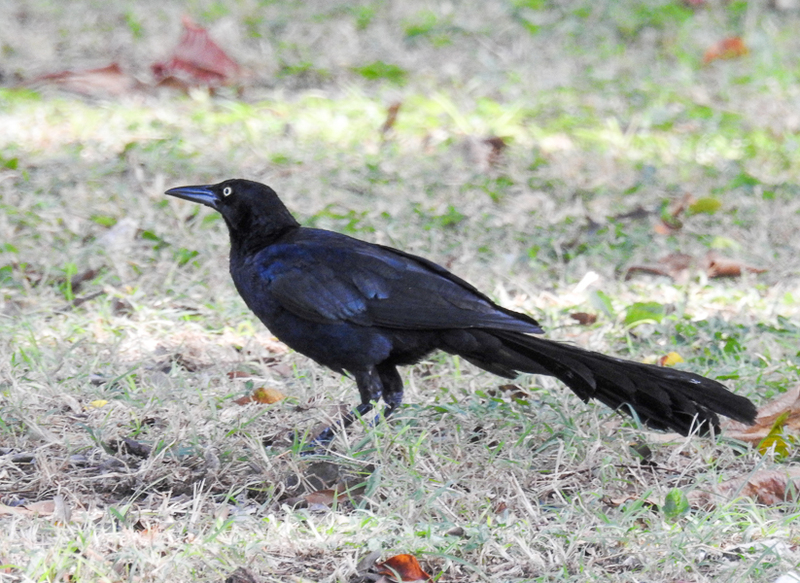 Here is a male Great-Tailed Grackle in the park in Merida. That is one impressive tail! 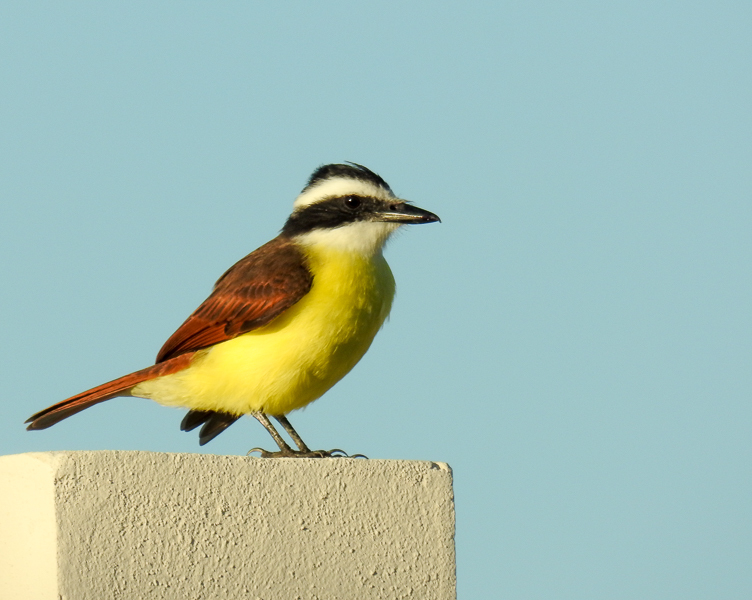 Update: We visited the Yucatan again the following summer and saw some more very cool birds. You can read about them here: More Birds Seen in Mexico. iBird Ultimate/North America: This is my favorite go-to birding app here in the United States and it includes many, but not all, of the birds I saw in Mexico. This app typically offers a wealth of information on most of the birds it covers including photos, id tips, range maps, sounds, behavioral information and more. BirdsEye Mexico: BirdsEye is a monthly subscription-based app here in the U.S. that uses eBird bird data to help you find birds. I use it on every birding trip and added Mexico as another monthly addition to the app. (BirdsEye itself is currently $2.99 a month and Mexico adds another $1.99 a month. You can discontinue the extra subscription when you return home if you like.) I found this app to be really helpful in an area like this where so many birds are unfamilar because you can point it to “Nearby Species” to get an idea of what birds other people have reported seeing in the area. When you see a new-to-you bird, especially if it is common in the area, as most of the birds we saw were, it helps you narrow in on possibilities. It also includes a brief write-up about the bird and photos. Merlin ID: This is a free app from the folks at Cornell Lab. While I typically like the more expansive iBird app better, this one offers extra (also free) bird packs including one for “Mexico: All” and one for “Mexico: Yucatan Peninsula“. (I got both.) I found it helpful during our trip. This app lets you set it for “Likely Birds” in the location you select. It separates them by type of bird and then ranks them by how likely or how unlikely it might be to see them today. It provides some photos, brief id information, sounds and range maps. eBird: eBird is another free app from Cornell Lab. This one lets you keep track of the birds you see and upload them to the lab as part of a citizen science type effort. eBird not only keeps track of your own birding lists, but also feeds birding information into the previous three apps so it is well worth participating. It works in Mexico too. While it is mostly a listing app, eBird can also be helpful with ids as well because if you try to list a bird that is uncommon and unlikely in that area (or at that time of year) it will alert you to make sure that you are sure about the id. I’ve had this feature keep me from embarrassing errors more than once! We loved Mexico and plan to visit again. And when we do, we’ll bring our binoculars, birding apps and cameras to document the birds that we see! I am only in Cancun for 6 days, mostly fishing with a friend. Your article was most helpful identifying the birds I have seen while fishing. Thanks so much. I’m glad it was helpful. Enjoy sunny days!